Your wedding day is a showcase of your love story, and you can highlight your story with a custom wedding invitation that you design. Today we’re looking at how to design wedding invitations, with a few key steps to remember along the way. A custom wedding invitation will help show off your personality, save money and is something you can hang on to forever. With proper planning, it’s not that hard to do. Whether you start with a wedding invitation template, or you create a design from scratch, it’s a beautiful way to brand your special day. While you might think the first step is starting to think about how the invitation will look, it’s actually picking a shape, size, and place to print the actual cards. These specifications will give you a lot of information and make the design process a little more worry-free because you’ll have parameters to work with from the start. Most cards come in a handful of standard sizes. You should also think about postage here as well. Non-standard shapes or sizes (such as items mailed in square envelopes) can require extra postage. Pick a printer as well. You can get wedding invitations printed and shipped to you online or use a local print shop. If you want special elements such a letterpress or foiling, this is the time to pick a place that can accommodate that printing request. Not all print shops can handle all techniques. Then it’s time to get a print template from the printer of your choice. This will give you the exact specifications of your invitation with shape, size, bleed and safe printing areas. What’s your style? Casual, formal, a little off the cuff? Try to use a color theme that you will carry into the wedding itself. Pick a visual theme for your wedding invitations. You’ll want to settle on a style that reflects your personality as a couple. You might spend a few days looking at options in galleries (including some of the great examples here) or already have a concept in mind. Try to use a color theme that you will carry into the wedding itself. Design elements such as color, typography and other style flourishes can also be used for the actual event from table cards to signage. You can also create custom (and matching) thank you cards to send attendees after the big day. Settling on a visual style early on for the duration of event planning can save you a lot of time and rework in the long run. If you aren’t going the template route, start collecting design elements or assets. Many couples like to use a photo on the invitation, whereas others go for a theme based on the destination of the wedding or more traditional divots or florals. 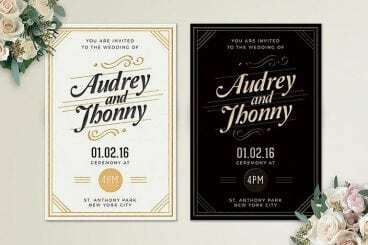 No matter which style you prefer, collect image assets that will be part of the wedding invitation design. If you have custom elements to incorporate such as photos, hand-drawn lettering or illustrations, make sure to get high-quality, high-resolution versions of these items for inclusion. Most printers will require images to be at 300 dpi or higher for printing. The font on your wedding invitation can speak volumes. While scripts are a popular option for more traditional designs, that’s not a hard and fast rule for modern couples. Lucky for you, the trend in wedding invitation design is that almost anything goes! When designing the invitation, don’t forget to think about the RSVP. How do you want people to let you know if they are coming or not? You can include a second RSVP card and envelope that can be returned to you, provide an email for RSVPs or ask for a phone call. There’s no right or wrong choice. Just remember to establish a way for wedding guests to let you know if they are coming. The big photo on your invitation should be the same big photo on your wedding homepage or registry website. Many couples don’t just send a wedding invitation, they create a wedding website for details about the big day. From logistics to photos, this is where everything lives. The easiest way to create this visual connection is through imagery. Use the same visual styling for all wedding materials. The big photo on your invitation should be the same big photo on your wedding homepage or registry website. Use the same wording and fonts to capture that theme as well. Once your design is ready, send it to the printer and approve the proof. Make sure to pay attention to turnaround times to ensure that the cards will arrive in time for you to mail them plenty of time ahead of the wedding. The standard practice is that invitations should be mailed six to eight weeks before the ceremony. Creating a custom wedding invitation can be a great way to show off your personality and flair for design. While a lot of people ask “how do I create a wedding invitation?” not that many couples actually do it themselves. Creating a wedding invitation isn’t that hard if you have an eye for design and it is something you can cherish forever. Good luck!